Do your headphones no longer work when plugged into your iPod Nano 6, maybe you can not even plug the headphone jack into the socket because its blocked, if so you will need your headphone jack socket replaced, we offer a fast low cost iPod Nano 6th generation headphone jack socket replacement service to restore your iPod Nano 6 back to full working order. * Our normal repair turnaround times are 3 - 10 working days. We always aim to complete repairs as fast as possible. 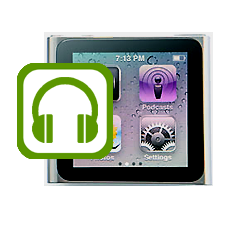 This is an in-house Apple iPod Nano 6th Generation repair service, when ordering this service you are required to ship your iPod into our repair centre for works to be undertaken.